Motivational speaker Caradh O’Donovan is a world class athlete. A former World and European Champion Kickboxer, she is currently a champion Karateka on the Irish Karate Team. Her successful athletic career of over 2 decades almost came to an end when Caradh was diagnosed with Crohn’s disease. She overcame this obstacle and motivates others to overcome theirs! In her talks, speaker Caradh O’Donovan draws on her experiences as an elite athlete and her journey to successfully overcoming a debilitating disease. What fuels her passion for motivational speaking is the thought of being able to help others who are going through difficult challenges like she did! Inspiring keynote speaker Caradh O’Donovan is frequently booked to speak at schools, businesses, events and conferences. What’s more, she combines her speaking events with mentoring as part of the Sport For Schools Programme. She is also an Ambassador with the Irish Society of Colitis and Crohns (ISCC). 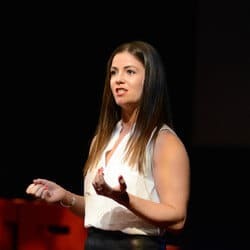 After successfully gaining an Honours Degree in Sport and Exercise Management and a Masters Degree in Sport and Exercise Psychology Caradh has worked in High Performance Sport for over ten years. Caradh is an expert on Building Resilience, Promoting positive Mental Health, Overcoming Adversity, Defeating Doubt, Keys to Success, Developing Self Belief and the Importance of Physical Activity. Book her to hear more about her moving story and to be empowered to overcome your obstacles. When keynote speaker Caradh O’Donovan was diagnosed with Crohn’s Disease in 2014, it seemed like her athletic career was lost. Crohn’s is a debilitating disease for which there is no cure. Yet she managed to successfully overcome the challenges which living with this disease brought. Even going on to regain her multiple World Cup Titles! She has moved on from kickboxing to karate and is now on the Irish Karate Team! Caradh beat Crohn’s disease and shows others how to beat their obstacles too as a motivational speaker!